In this page, you’ll learn about some of the nifty hidden functions that you can perform from the contacts module. The price list feature allows you to apply customized product rates for each contact. Using price lists you can create independent lists with customized item prices by either marking up or marking down the selling prices of selected items or your entire inventory. You can then associate a price list to a contact so that every time you create a transaction for the particular contact, the customized items rates are applied. Insight: Learn how to create price lists in Zoho Inventory. Create a new contact or click to open an existing contact. 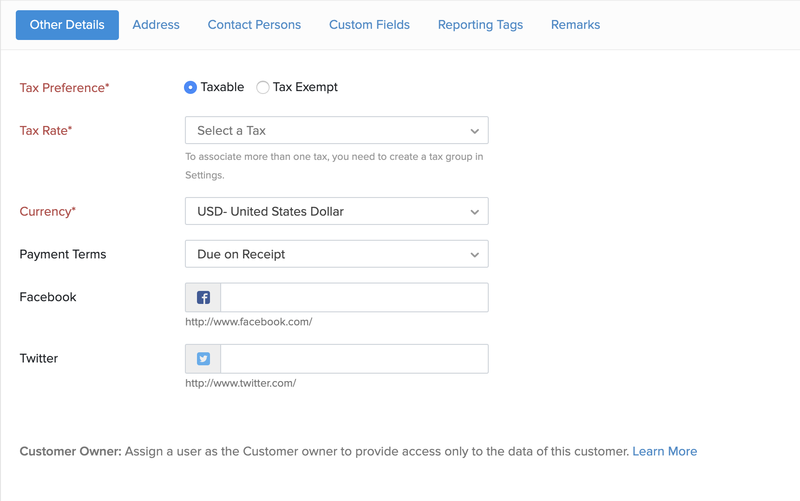 Go to the Tax & Payment Details section. Click the drop down for Price List. Click Save to apply the price list for the contact. When you receive payment from your customer, you can automate a thank you note to indicate the payment receipt. This especially comes in handy when your customer pays you online. Enable this option within the Invoice Preferences under Settings. Learn more. Select the ‘Send a “thank you” note for this payment’ option while recording payment manually. Learn more. You can also customize your ‘thank you’ note content by from the Email Templates module. Learn more. Depending on the type of contact, you can create sales or purchase transactions from the contact page directly. Go to the Contact module in the sidebar. Click the New Transaction button in the top-right corner of the contact page. Click the Save button to finish. You will be able to find this transaction as a draft under its appropriate module. While creating or editing an item, you can set a reorder point and tag a preferred vendor from whom you’d like to re-purchase them. When for an item, the stock drops below the reorder point, you will receive a notification. Insight: Learn how you can enable reorder alerts when an item is low in stock. Click the contacts filter in the top-left corner of the contact list page. 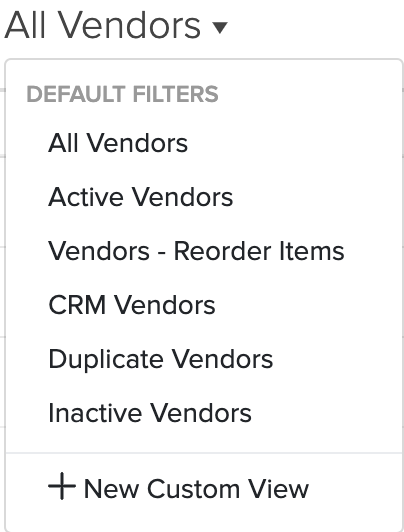 Select the Vendor - Reorder Items filter from the drop down. Vendors who currently have at least one item associated with them that is in the low stock zone will be listed. Click to open the preferred vendor. Click the Order Now link in the vendor details page. Name Name of the low stock item. Select the items that you want to reorder. Reorder Level The reorder point that is set for the respective items. Stock on Hand Total available stock for the item from all your warehouses. Unreceived Stock Stock that you have ordered and are yet to receive from your vendor. Tip: Go to purchase orders and create Purchase Receives to increase the available stock for those items. Order Quantity Enter the quantity to reorder for the respective items. Pro Tip: The Calculate link under the Quantity to Order field will calculate the minimum stock required to bring the items out of the low stock zone automatically. If the calculated value is zero, it means that you have already purchased enough stock and are yet to receive them in Zoho Inventory. Go to purchase orders and create Purchase Receives to increase the available stock for those items. Click the Add button. The selected items will be added to a new purchase order. Select a delivery location for the goods. Click Save at the bottom. A draft purchase order will be created. Go to More and mark the purchase order as Issued or email the order to your vendor. Click the More button in the top-right corner of the page. Select Email Contact option from the drop-down. Here you can add or select from the pre-defined contact email address. Provide subject matter and write the email body text. 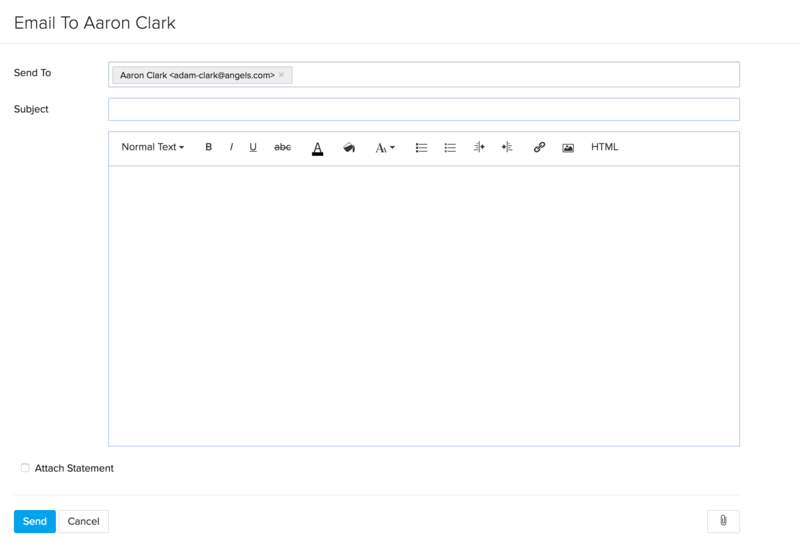 Use the rich text editor to customize the email as you see fit. You can also add the customer statement as an attachment. Click the Paperclip icon to browse and attach more files. Click Send to send the email to your contact.